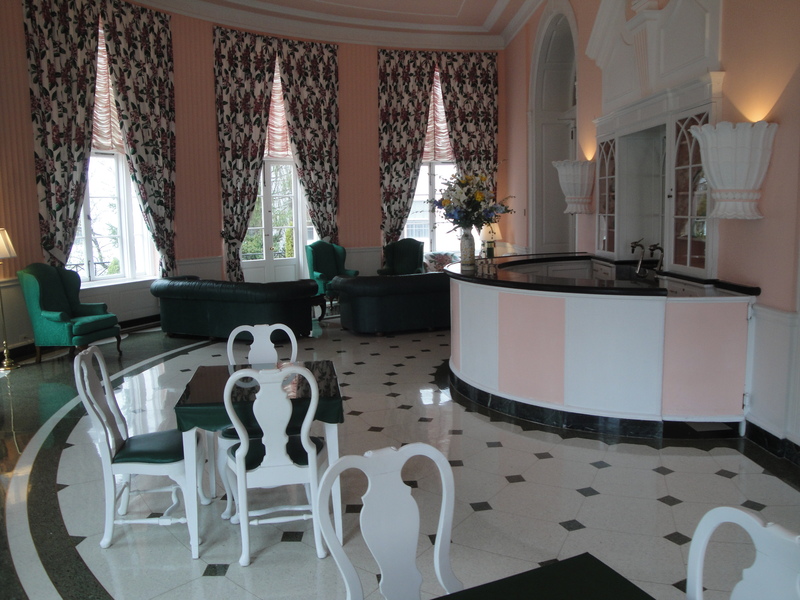 The Greenbrier is located in White Sulphur Springs, West Virginia for a reason. Sulphur water is what attracted people to the area in the first place. 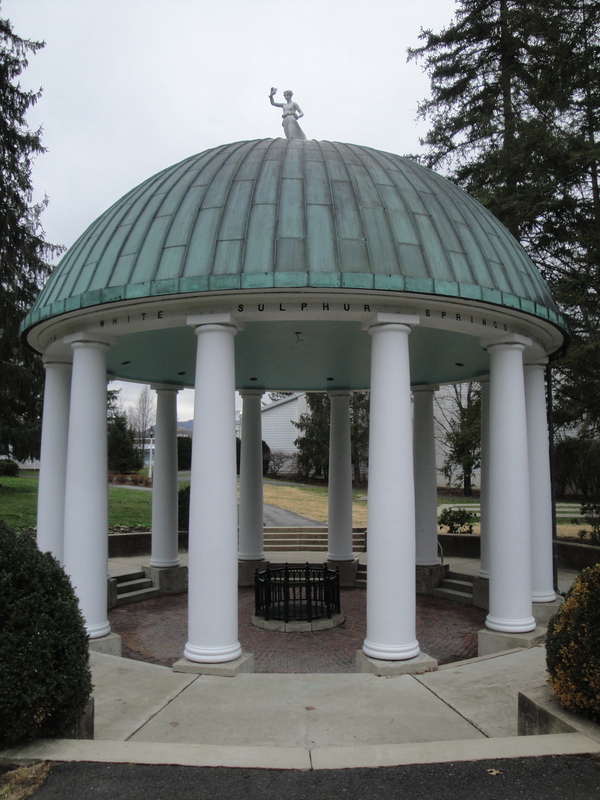 The Greenbrier’s iconic logo is the Spring House, a Greek revival structure that marks the head of the sulphur spring, and one of the rooms at the Greenbrier features fountains where guests used to be served glasses of sulphur water to drink. Imagine, voluntarily drinking a glass of sulphur water! For a long time, Americans thought that sulphur water had significant healing properties and helped cure rheumatism and stomach ailments and other afflictions. People traveled for miles to “take the waters” at White Sulphur Springs, or sample the “Pluto Water” in French Lick, Indiana, or visit other resorts found at the heads of sulphur springs. Eventually, of course, tests confirmed that there were no health benefits to consuming sulphur water — or for that matter, steeping in hot sulphur water versus other hot water — and sulphur water became a nuisance to be addressed rather than a boon to be celebrated. I think of sulphur water when I see a new pop-up website ad touting a simple way to reduce belly fat, or increase energy, or enhance sexual potency. Americans have always been targets for the snake-oil salesmen preaching about the latest miracle cure — because we don’t want to believe that the only way to a flat stomach is a good diet and plenty of exercise. At least the sulphur water health phenomenon had the benefit of producing some fine resorts along the way. I just finished Stieg Larsson’s second book of the Millennium trilogy, The Girl who Played with Fire and I found his second book more entertaining than his first. I am not going to offer any hints about the plot in the second book as I have a few friends reading it at this time and I don’t want to ruin it for them (Bob revealed a key detail about the ending to book two in one of his blogs some time back, thanks Bob). All I will say is the plot in the Larsson’s second book continues to revolve around the two main characters he developed in his first book, Lisbeth Salander and Michael Blomkvist and murder is involved. The thing I like about Larsson’s writing style is the way that he skips around from character to character giving their perspective on the events that are unfolding in the story line. Book two ends with a cliff hanger wanting you to get book three ASAP. Larsson was not your typical lifetime writer, beginning his fiction writing at age 48 when he was bored while on vacation. He planned on writing ten books in all with proceeds from the book going towards funding his retirement. He was a workaholic and a non-stop smoker who went to the office one day and found the elevator was out of order so he climbed seven flights of stairs and eventually collapsed in his office after having a heart attack at the age of fifty – damn elevator ! It is only my humble opinion, but Larsson truly had a gift and was a wonderful author and I will be very sad when I finish book three knowing there is nothing left from him to read. My iPod seems to have given up the ghost. One day the music stopped and when I looked at the screen, I saw strange and terrifying symbols. I tried restarting it and heard unwanted clicking sounds, and then saw even more strange and terrifying symbols. When I got home and plugged it into the computer, I realized that all of my music and playlists had been wiped out. I think it is safe to say that the iPod has gone toes-up. 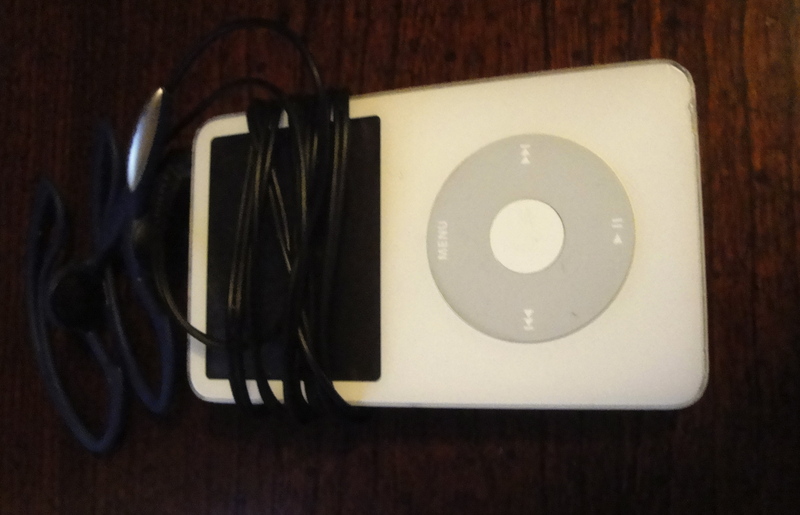 The iPod was a 2005 model, with 30 GB storage capacity. On most days it was used for several hours. It provided music on my morning walks and music when I got home at night. It supplied essential airplane tunes on long, boring trips and welcome musical accompaniment on sun-splashed decks in the Bahamas and during beer-soaked cards games on Hen Island. It has served long, nobly, and well. But now my carefully constructed playlists appear to be gone forever. I need to replace the trusty iPod. I’m inclined to stick with Apple, because I think they are like the Honda of the technology world — you can count on them to make durable and reliable products. My request for advice is: is there any reason not to get another iPod classic? If you are not a gamer — and I’m not — is there any reason to get an iPod touch? If you just use your iPod for music, music, and more music, is there any reason to get any of the other iPod products?